FRANKFURT MUSIKMESSE 2010 PRESS RELEASE: PreSonus has announced version 1.5 of its Studio One™ DAW software. This major free update adds so many important features and enhancements that the company decided to skip the previously planned version 1.1 and go directly to this more advanced version. Key additions include support for video playback and sync for composing to picture; major enhancements to the Browser's drag-and-drop capabilities; the ability to draw your own automation waveforms; automation points that are locked to events; a new key-command editor; changing tempos within a event without slicing the event into separate events, and support for song and album art. A first-of-its-kind, built-in SoundCloud client enables you to upload audio files from Studio One directly to the web. The MIDi features have been improved, including a new MIDI file player in the Browser. We've enhanced the Native Effects plug-ins and added new ones. And that's by no means all that is in this impressive update. Let's take a closer look. Those who create sound for picture will be delighted with the new video features. You can now import any QuickTime video into a song for playback and sync, with adjustable video playback size and time offset. Simply drag-and-drop the video from the Browser into the arrangement to import it and, optionally, simultaneously extract the audio from the video and place it on a new audio track. A new Follow Edit Position helps sync to specific video frames, by adjusting the playback-cursor position based on the current edit position. Browser drag-and-drop functionality has improved significantly. Drag an audio event to a location in the File Browser to instantly export a new audio file to that location. Drag an Instrument Part to the File Browser to export a MIDI clip to a specific location on your drive. Drag any insert effect or virtual instrument from the Device Rack to the Effects or Instruments Browser to store a preset for the effect or instrument; alternatively, drag to the File Browser to export the preset to a specific location on your drive. You can now draw automation waveforms, and automation points are locked to selected events, so automation moves with the related events. A transform function lets you scale, stretch, and otherwise modify automation envelopes. An Undo history enables viewing and undoing all edits done since the file was opened, even if you have saved since then. A pitch-name editor is available in the drum layout, and you can save and load names from a pitch-name list. Version 1.5 adds a new key-command editor with Search and Learn features for creating and modifying keyboard shortcuts. The search feature finds specific key commands and shows which functions they trigger and also finds specified functions and displays the key commands to which they are assigned. Studio One now uses dynamic timestretching to change tempos within an event, rather than having to slice the event into separate events with different tempos. Constrain position when dragging events between tracks within a defined range, use a keyboard shortcut to fast-forward and rewind by measures, and accelerate scrolling while dragging with the new Turbo mode. When you select a region on a track, you can now extend the selection using Shift and the Up/Down arrow keys. When you select and remove a range in the Edit menu, the time in between regions will be deleted and the regions will snap together. Album and Song Art can now be added to the Project and will be included in any exported Digital Release. A new menu item enables you to upload songs, art, and metadata to the SoundCloud Web service directly from Studio One. Support for REX files also has been added. If you right-click a REX file in the Browser and select "Send to new SampleOne," all slices are imported into SampleOne, and a new Instrument Part is created. Alternatively, you can drag the whole REX file, or individual slices, into the arrangement. Plug-ins can now be bypassed, and this can be automated. A new Level Meter plug-in provides an extra-large peak/RMS display. The PreSonus Presence™ virtual instrument has been redesigned, upgraded to 96 voices, and enhanced with effects, including modulation effects, pan, delay, distortion, gate, reverb, and a 7-band graphic EQ with settings for Lead (center frequencies range from 50 Hz to 10 kHz) and Bass (100 Hz to 6.4 kHz). The Impact™ virtual instrument adds Velocity layers, an envelope Hold parameter, and a multimode low-pass, bandpass, or high-pass filter with 12 dB or 24 dB slope. To load effects to a specific output channel, just drag the effect onto a pad. The Spectrum Meter plug-in and the spectrum meter on the Project page (in Studio One Pro) have gained average and peak-hold level indicators with variable time intervals for precise level analysis across the frequency spectrum. A new Scope plug-in provides in-depth oscilloscope functions for troubleshooting and measurement within Studio One, including three independent/overlaid channels with stereo and sidechain input selection and a mathematical operation channel (A-B, A-C, and B-C). Version 1.5 also includes several MIDI enhancements. The file Browser has gained a MIDI preview player that sends the MIDI data to a selected Instrument Track for playback. The player displays the MIDI file's length in bars and the number of notes in the pattern. Previously, MIDI quantization only affected Note On messages; now note ends (Note Off) can be quantized, as well. The Gate plug-in now sends MIDI note messages—perfect for drum replacement. Furthermore, MIDI files can be expanded in the Browser, and individual tracks can be dragged into the arrangement. The export features have been significantly improved, including the ability to export entire channels as stems, complete with buses, effects, and instrument returns. In addition, when you export adjacent regions (between markers), you can now create custom-length overlaps at the head and tail of each region so that you can crossfade between the exported files. This works sort of like a pre-roll and post-roll. 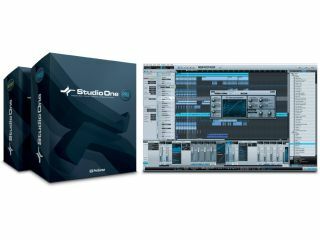 Studio One creates a folder for each region with a name derived from the marker name. Version 1.5 is expected in April 2010 and will be a free update to registered users.